← Astounding Review of ANTI Premier! ]MY WATERY SELF: MEMOIRS OF A MARINE SCIENTIST by Stephen Spotte netted an outstanding review in LIBRARY JOURNAL, the library industry’s gold standard for book rating of upcoming titles. 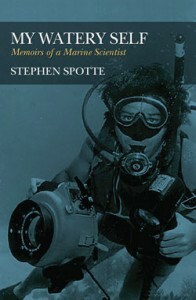 Dr. Spotte, a notable figure in the development of the modern public aquarium, has published eighteen books, including three volumes of fiction, a memoir, and a work of cultural theory. He is a Certified Wildlife Biologist of The Wildlife Society and also holds a U.S. Merchant Marine officer’s license, who began life in a tiny West Virginia coal mining town. MY WATERY SELF is now available for ordering via Amazon, Barnes & Noble, Powell’s Books or your favorite indie bookstore. Or check it out at your local library. And remember — if they don’t have it, be sure to request it! Also available directly from Three Rooms Press. Buy it now! To find out more about Dr. Stephen Spotte and MY WATERY SELF, click here.